Stephens died in 1897, and in 1899 Pettigrew commissioned John Honeyman & Keppie to carry out an altogether more ambitious enlargement. A precedent had been set by Bruce & Hay's recent additions to the neighbouring Copland & Lye department store, which now stretched from Sauchiehall Street along Wellington Street all the way to Bath Street. 7 Honeyman & Keppie's scheme for Pettigrew was more compact, but also taller and more imposing. A third shop was added to the Sauchiehall Street frontage, so that it extended from the corner of West Campbell Street to the Fine Art Institute. A perspective drawing by Alexander McGibbon was widely published at the time, and further information about the design can be pieced together from contemporary press descriptions, early insurance valuations and photographs taken before and during demolition in 1971. W. S. Moyes, who worked for John Honeyman & Keppie in the 1890s, wrote 50 years later that John Keppie alone was responsible for the design of Pettigrew & Stephens. Mackintosh's contribution, he recalled, was limited to 'some internal show cases [and] internal wall decoration'. 8 However, other features can be attributed to Mackintosh on grounds of style. The Glasgow Herald described the style of the new building as 'Renaissance'. 13 The facade was 'white freestone with moulded and carved dressings', the rear elevation to Sauchiehall Lane 'square dressed rubble'. 14 Most of the ground floor was given over to huge display windows. On the upper floors, windows were arranged in continuous bands divided by narrow strips of masonry or columns, providing good natural lighting. Dormer windows with pedimented gables made a lively skyline above the balustraded cornice. The drawings for the dormer pediments show them filled with roundels of curvilinear decoration, which look like Mackintosh's work. It has been suggested that the Pettigrew & Stephens dome was adapted from Mackintosh's design for an octagonal, domed Chapter house, entered unsuccessfully in the 1892 Soane Medallion competition. 20 Although it shares the slightly pointed profile of Mackintosh's competition design (ultimately derived from Brunelleschi's dome for Florence Cathedral), the resemblance is otherwise very slight, and as far as Moyes could remember, Pettigrew & Stephens' dome 'was the work of Mr Keppie and Mackintosh had no influence on the design'. 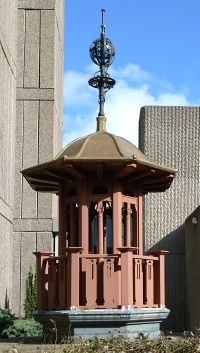 21 However, the distinctive lantern does resemble the one on top of the chapter house, and by the 1970s it had come to be regarded as Mackintosh's work. It certainly has little in common with the classicism of the rest of the Sauchiehall Street shop, but its shallow, reverse-ogee cap with deep eaves recalls Mackintosh's 1892 design for a Railway Terminus, the tower of the Glasgow Herald and the ventilators on the roof of Martyrs Public School. Its balustrade of flat boards with pierced ornament recalls the S.W. gallery stair at Queen's Cross Church, and the pattern of the piercings is like the glazing of the doors at Queen's Cross. 'Tea and luncheon rooms, furnished in luxurious style' were on the second floor overlooking West Campbell Street (the kitchen was on the top floor, to prevent cooking smells invading the sales areas). 25 Views of the tea rooms around 1909 show a decorative scheme in which classical plasterwork predominates, but there is also a partition incorporating leaded glazing and settles in curved recesses, which has features in common with designs of 1900–2 by Mackintosh. 26 The curved recesses recall the Reception and Music Room of the House for an Art Lover (1901), while the arm rests of the settles are similar to the built-in seating for the drawing room at Dunglass Castle (1900), the Children's Room of the House for an Art Lover (1901–2) and the Waerndorfer music salon in Vienna (1902). In 1904, Pettigrew leased the building of the Fine Art Institute next door at 171–179 Sauchiehall Street, and began using it as his furniture department. 29 Designed in 1878 by J. J. Burnet (1857–1938), the Institute had shops on the ground floor and a suite of top-lit exhibition galleries on the first, reached by a central entrance vestibule and imperial stair. In 1906, Honeyman, Keppie & Mackintosh made various minor changes to adapt the whole building as an extension of Pettigrew & Stephens and link it internally with the rest of the shop. Further minor works to the basement followed in 1909, and in 1910 the exterior stonework was silicated. In 1914–15, the practice was employed on extensive alterations to the shopfronts, for which bronze work was supplied by the Birmingham Guild Ltd. and sculpture by Albert Hodge. 1: University of Glasgow Archive Services: House of Fraser archive, memorandum of agreement between Andrew Hislop Pettigrew and William Henry Stephens, FRAS 110; for a brief biography of Pettigrew, see Glasgow Contemporaries at the Dawn of the 20th Century, Glasgow: Photo Biographical Publishing Company, 1901, p. 198, with portrait photograph. 2: The Eagle, 2, 30 September 1909, pp. 9–10. 3: Glasgow City Archives Collection: Glasgow Dean of Guild Court, Register of Inspections, D-OPW 25/63, p. 22. 4: Glasgow Herald, 20 December 1895, p. 4. 5: Glasgow City Archives Collection: Glasgow Dean of Guild plans, 1/4290. 6: Glasgow City Archives Collection: Glasgow Dean of Guild Court, Register of Inspections, D-OPW 25/63, p. 101. 7: Glasgow Advertiser and Property Circular, 27 September 1898. 8: University of Toronto, Robarts Library: letter from W. S. Moyes to Thomas Howarth, 29 April 1947, B96-0028/017 (13). 9: Glasgow City Archives Collection: Glasgow Dean of Guild Court, Register of Inspections, D-OPW 25/64, p. 41; Glasgow Herald, 27 April 1901, p. 1; p. 6. 10: Glasgow Herald, 15 November 1899, p. 4. 11: Edinburgh, Royal Commission on the Ancient and Historical Monuments of Scotland: negative GW/2165. 12: Glasgow Herald, 14 March 1904, p. 11. 13: Glasgow Herald, 27 April 1901, p. 6. 14: University of Glasgow Archive Services: House of Fraser archive, valuation of premises at 181–193 Sauchiehall Street, GB0248 FRAS 115/2. 15: Edinburgh, Royal Commission on the Ancient and Historical Monuments of Scotland: negatives GW/1094, GW/1095, GW/1099 and GW/1100. 16: Pearson's Gossipy Guide to Glasgow, the Clyde District and the International Exhibition of 1901, London: C. Arthur Pearson, , p. 2 of Supplement; Glasgow To-Day, Glasgow: Henry Munro, 1909, pp. 56–9. 17: British Architect, 32, 22 November 1889, p. 362 and illustration. 18: Glasgow Advertiser and Property Circular, 24 January 1899; Glasgow Post Office Directory, 1900. 19: Pearson's Gossipy Guide to Glasgow, the Clyde District and the International Exhibition of 1901, London: C. Arthur Pearson, , p. 2 of Supplement. 20: Thomas Howarth, Charles Rennie Mackintosh and the Modern Movement, London: Routledge & Kegan Paul, 2nd edn, 1977, p. 13. 21: University of Toronto, Robarts Library: letter from W. S. Moyes to Thomas Howarth, 29 April 1947, B96-0028/017 (13). 22: The Hunterian, University of Glasgow: GLAHA 52337 (M124-014); GLAHA 52473 (M124-013). 23: Glasgow Herald, 27 April 1901, p. 6. 24: University of Glasgow Archive Services: House of Fraser archive, valuation of premises at 181–193 Sauchiehall Street, GB0248 FRAS 115/2. 25: Glasgow Herald, 27 April 1901, p. 6; Glasgow Herald, 14 March 1904, p. 11. 26: Glasgow, Mitchell Library: Glasgow Scrapbook 8, p. 43; Glasgow To-Day, Glasgow: Henry Munro, 1909, pp. 56–9. 27: Glasgow Herald, 3 April 1899, p. 8. In 1903, Honeyman, Keppie & Mackintosh showed an elevation of the central part of the facade at the Royal Scottish Academy. This made a better impression by omitting the unbalanced flanking parts, and the Scotsman described it as 'a boldly treated warehouse front':Scotsman, 30 March 1903, p. 9. 28: Building News, 77, 18 August 1899, p. 193. 29: University of Glasgow Archive Services: House of Fraser archive, valuation of premises at 181–193 Sauchiehall Street, GB0248 FRAS 115/2; Glasgow Herald, 14 March 1904, p. 11. 30: Charles Rennie Mackintosh Society Newsletter, 2, January 1974. 31: The Environment Show at the Glasgow Garden Festival '88, [Glasgow, 1988] p. 11. 32: A copy of the report (MBS12) is held by the Charles Rennie Mackintosh Society, Mackintosh Queen's Cross, 870 Garscube Road, Glasgow G20 7EL. The Mackintosh Buildings Survey was funded by The Monument Trust.